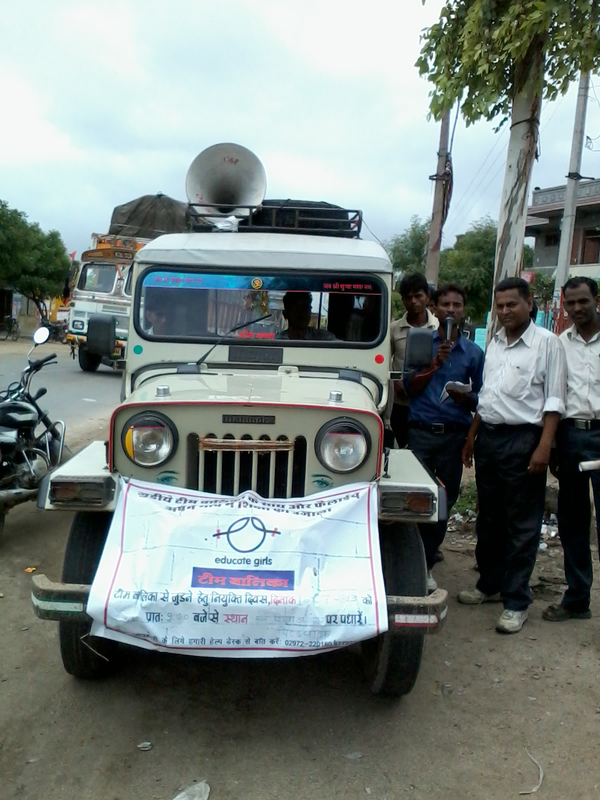 An Educate Girls van ready to recruit Team Balika members. We asked our summer intern Eliana Machefsky, undergrad student from University of Pennsylvania, USA to tell us about a memorable day spent with Educate Girls’ regional team in Rajasthan. With a twinkle in her eyes, this is what she shared. “When I was little, I would wake up early in the morning on Thanks Giving Day and, along with most of America, tune my television to the national broadcast of the Macy’s Thanks Giving Day Parade. I watched in wonder as the procession of floats advanced across my screen, and I tried to imagine what it might feel like to be just one small part of the extravagant affair. Never did I imagine, that one day I would be part of a parade of sorts, and that its route would follow the dusty roads connecting the villages clustered around the town of Sanchore in the Jalore district of Rajasthan. The float wasn’t elaborate—just a silver, 4-wheel drive jeep with a sticker bearing the Educate Girls emblem fixed to the windshield and a megaphone strapped onto the front grill. I climbed in, along with Shivraj from the Bali office, Geetanjali from the Mumbai office, my fellow interns Ali and Sudi, and our driver. Our task was an important one—to advertise throughout the villages for the Team Balika recruitment event scheduled for the following day in Sanchore. Team Balika is a critical component of the Educate Girls mission. Its members are the village representatives who speak with families about the benefits of an education in an attempt to convince them to enroll their girls in school. They visit the schools to make sure that the teachers are using the child-friendly Creative Learning and Teaching techniques that Educate Girls has developed. As the local catalysts for community mobilization, Team Balika members are key to the sustainability of Educate Girls’ efforts. I could not help but smile as I watched the children race to catch the flyers that we sent fluttering out the jeep’s windows. Men and women did not simply give the flyers a cursory glance, but really stopped to read them and learn about the Educate Girls mission. Gitanjali held a flyer outside of her window for a woman to take, and for a moment, both of their hands grasped the paper at the same time. It was a kind of passing of the baton, a signaling of full support should this woman decide to take action. In fact, this was not a parade, but a crusade, with much greater significance than anything I could have watched on T.V. It was a call to arms for the fight against discrimination, against illiteracy, and against inaction. Although Shivraj did most of the advertising, he passed the microphone to me to try out the Hindi phrases I had just learned. I shouted the Team Balika motto, ‘Humara sapna, hum he madiyam! ‘(Our dream, we are the medium!). I was filled with exhilaration to be just a small part of this fight. 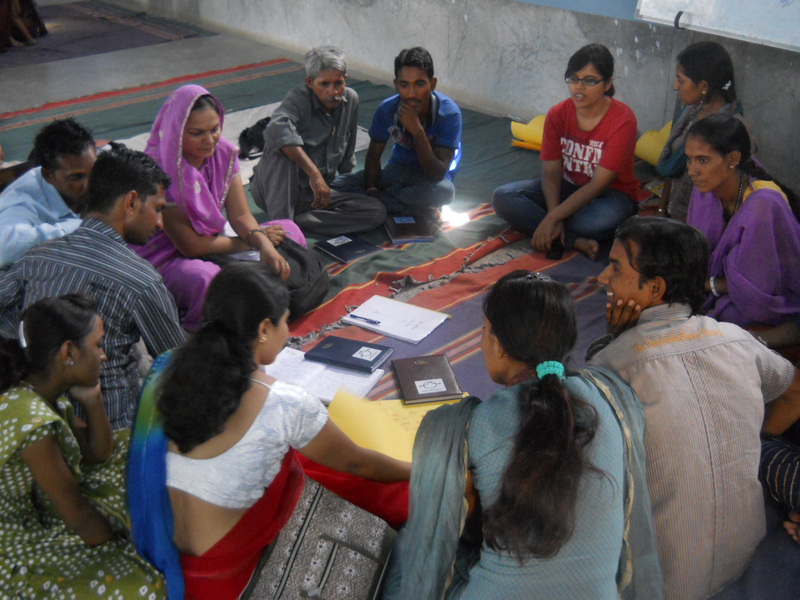 New Team Balika recruits learning about Educate Girls.